Six-time major winner Sir Nick Faldo will play in his last Open in July. Faldo, who will turn 58 during the 2015 event, has won the Claret Jug three times, including in 1990 at St Andrews, the venue for this year's competition. 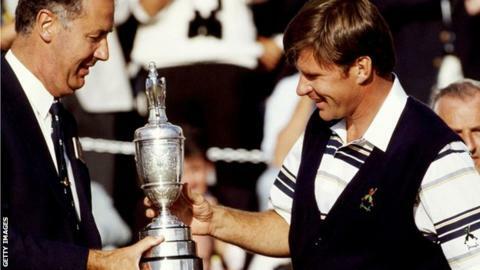 "The Open and St Andrews will forever hold a significant place in my heart," said Englishman Faldo. "My fondest moments on my journey with this great sport are woven with pictures and emotions in this setting. It all means a huge amount to me." Faldo also won Open titles at Muirfield in 1987 and 1992, as well as winning the Masters at Augusta on three occasions. He will join five-time Open champion Tom Watson, who will also be making his final appearance in the Championship, held from 16 to 19 July. Peter Dawson, chief executive of golf's governing body The R&A, said: "Sir Nick Faldo is an inspirational figure in British golf and has enjoyed a remarkable career in the Open. "I'm sure there will be great anticipation among the galleries at St Andrews to see him play in the Open once again and he will receive a rousing ovation worthy of a great champion."